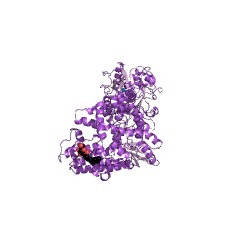 Polbase - Reference: Crystal structure of Thermus aquaticus DNA polymerase. The DNA polymerase from Thermus aquaticus (Taq polymerase), famous for its use in the polymerase chain reaction, is homologous to Escherichia coli DNA polymerase I (pol I) Like pol I, Taq polymerase has a domain at its amino terminus (residues 1-290) that has 5' nuclease activity and a domain at its carboxy terminus that catalyses the polymerase reaction. Unlike pol I, the intervening domain in Taq polymerase has lost the editing 3'-5' exonuclease activity. Although the structure of the Klenow fragment of pol I has been known for ten years, that of the intact pol I has proved more elusive. The structure of Taq polymerase determined here at 2.4 A resolution shows that the structures of the polymerase domains of the thermostable enzyme and of the Klenow fragment are nearly identical, whereas the catalytically critical carboxylate residues that bind two metal ions are missing from the remnants of the 3'-5' exonuclease active site of Taq polymerase. The first view of the 5' nuclease domain, responsible for excising the Okazaki RNA in lagging-strand DNA replication, shows a cluster of conserved divalent metal-ion-binding carboxylates at the bottom of a cleft. The location of this 5'-nuclease active site some 70 A from the polymerase active site in this crystal form highlights the unanswered question of how this domain works in concert with the polymerase domain to produce a duplex DNA product that contains only a nick.